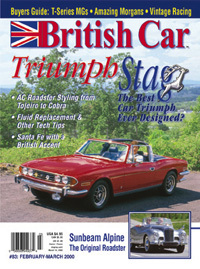 Back in 1999, Gary Anderson , the editor of British Car Magazine, solicited his readers for someone with a Stag to do an article for the magazine. I wrote the article and my brother-in-law, Louie Delarnoux did the photography. We were very surprised when the story was used as the cover for the February/March 2000 edition. The pictures were taken here in scenic southern PA. The Stag is quite a rare car and the feature on the cover helps to promote a car that is often overlooked by British car fans. I will publish the entire article here when I get some time to update the site.